If your agency offers digital marketing services like SEO, social media, email marketing, PPC, chances are you’re in high demand. AdAge reports that digital is the fastest growing business area for agencies of all types. So, if the demand for your agency’s’ digital services are so high, why are you spending so much time writing proposals and chasing new business? The answer is probably that you (like many other agencies) are doing a lot of one-off projects – website redesigns, ad hoc social campaigns, or sporadic email sends. Why are digital marketing agencies in such high demand? The simple answer this: in-house marketers are overwhelmed or don’t have the expertise in all the new channels of digital marketing. The digital landscape buyer’s encounter has become incredibly dynamic and complex. There are new social media networks that pop up seemingly overnight, ad serving and tracking technologies are constantly evolving, and mobile devices have revolutionized how and when buyers consume information. Clients that hire digital marketing agencies get a timeshare of experts for each digital channel, creative staff to bring campaigns to life, and experienced account managers that can pull together a cohesive digital strategy. Many digital services that are considered one-off projects such as SEO, social media, content marketing, website redesigns – are great candidates for retainer services because they require time, ongoing attention, and expertise to drive successful results. So, how do you get there? Here are six steps to win more retainer-based business. When a prospective client comes to you for a project proposal, sure you can dive right into project deliverables but how about taking a step back and asking them about their business goals? Once you understand their business goals you can ensure any proposal you write for them will help them meet their business objectives as well as propose additional services from your portfolio that will help them be successful. There is obvious synergy between activities such as SEO, PPC, content development, and social media. In-house marketers are starting to want to integrate their marketing programs to develop and execute a more comprehensive strategy. The more services your agency has to offer, the more you’ll be able to tailor retained services packages that meet your clients’ needs. They’ll appreciate the extra value that you deliver and be happy to have fewer vendors to manage. One example would be to offer service bundles versus discrete services. Whether you’re working on a project or on a retained services contract, you need to prove that you are delivering value, month after month. That means providing regular, consistent reporting on a set of metrics you and your client have agreed upon. Your clients turn to you because they lack the expertise and bandwidth they need to succeed in today’s digital landscape. 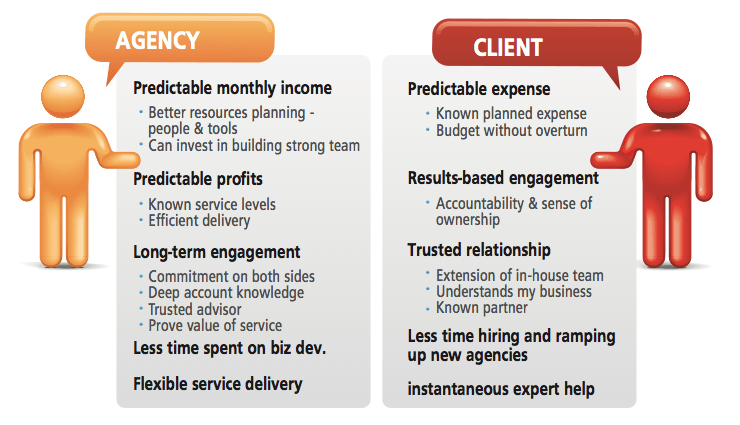 Their decision to hire and retain your agency also depends on your ability to run your business efficiently. If you choose the right digital marketing platform, you’ll enjoy both lower license fees and the operational efficiencies that come from using one easy-to-use integrated solution instead of several stand-alone tools. You can pass on the cost-savings to your client, making your business more competitive and the job of justifying your retained fees much easier. Regular client meetings and consistent reporting are factors that should keep you firmly planted with your client and viewed as a valuable partner and extension of their team. But sometimes despite your best efforts, engagements may end. This may be due to a change of key personnel at your client, budget cuts or a shift in priorities. Whatever the reason, it’s important to always maintain good relationships with all client contacts. Keep in touch, keep it positive and help out where you can. Do this and you’ll maximize the chance of referrals and be the agency that your contacts will call when budget reappears or they move to a new company that needs digital marketing expertise. Update your website – regardless of how a prospect hears about you, they’re probably going to end up on your website at some point. Are you showcasing your best marketing skills? 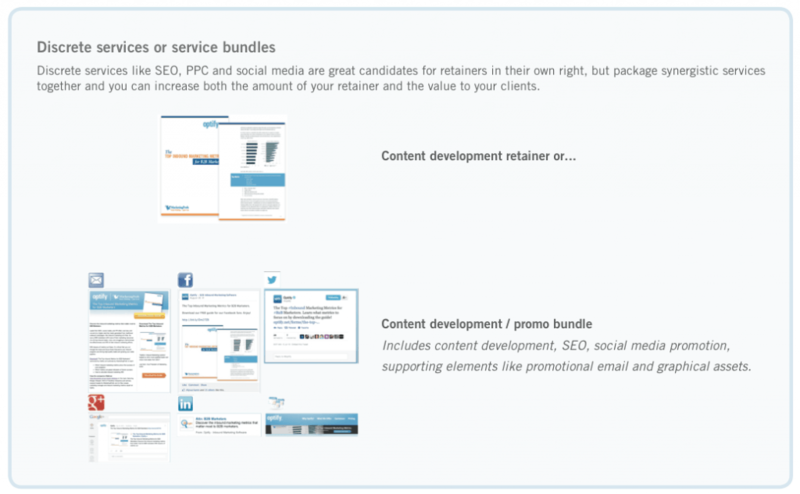 Update your social profiles – have a complete profile filled out and start sharing content! Practice what you preach – you preach your customers on the importance of blogging and content marketing, but your last blog post was on (the old) myspace. Put the same effort you would behind planning and executing a content strategy as you would for your customer. Make sure both your current clients and prospects know what services you offer – how many current clients know about your new service offerings? Become and industry expert – your team has a lot of marketing knowledge. Be sure you are proactive in sharing it! Optify’s “From One-Off Project to Long-Term Retainers in 6 Easy Steps” guide offers more descriptive and actionable ways to execute each step. Download the guide, unless of course you like writing proposals and chasing new one-off projects!